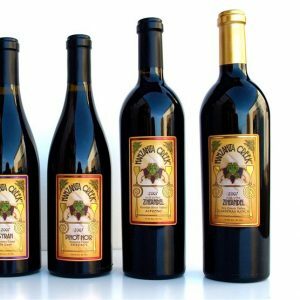 Manzanita Creek is a small family-owned winery specializing in vineyard-designate Zinfandels from five different Sonoma county appellations, as well as Syrah, Cabernet Franc, Cabernet Sauvignon, Chardonnay, Bordeaux Blend and a stunning Late Harvest Zinfandel. The winery grew from Jack and William Salerno’s passion to produce wines they would enjoy and be proud to share with friends and family. Seeking the best grapes sources throughout Sonoma County, the Salerno’s produce award-winning wines vintage after vintage.